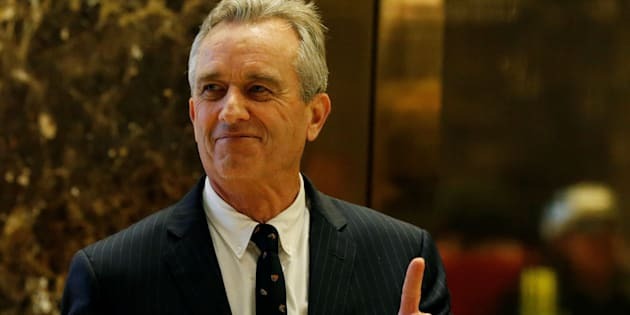 President-elect Donald Trump made his previously vague stance on vaccines much clearer on Tuesday, when he invited vaccine skeptic Robert F. Kennedy Jr. to chair a panel on vaccine safety and scientific integrity. Like many people who speak out against current vaccination practices, Kennedy says he’s fine with the concept of the shots but strongly opposes the use of thimerosal ― a preservative that hasn’t been used in childhood vaccines in the U.S. since 2001. Kennedy’s position against a scary-sounding chemical compound may seem measured, considering he has acknowledged that vaccines have saved millions of lives around the world and has said he vaccinated all six of his children. But he has also alleged that there’s a global corporate and governmental conspiracy to hide the supposed effects of thimerosal on young children, lobbied politicians to remove thimerosal from even more vaccines, edited a book about thimerosal’s supposed dangers and advocated for films that promote similar views. In reality, the human body can easily break down thimerosal ― research shows that an infant’s body can expel it in about half a week ― in a process that produces a compound called ethylmercury. Ethylmercury is very different from methylmercury, a heavy metal and neurotoxin found in certain foods, including fish. We’re exposed to methylmercury throughout our lives, but the compound takes much longer to be cleared from the body and can cause serious damage to our nervous system if we ingest too much of it. Plus, thimerosal isn’t even used in U.S. childhood vaccines anymore, with the exception of some flu shots. The Centers for Disease Control and Prevention decided in 1999 to remove the additive after vaccine critics and parents became concerned that it could somehow contribute to autism. Since then, several high-quality scientific reviews and studies have rejected the notion that thimerosal may in some way cause autism. Promulgating false information about vaccine ingredients is a type of anti-vaccine argument and can scare people away from the life-saving shots, Dr. Paul Offit, director of the Vaccine Education Center at the Children’s Hospital of Philadelphia, told The Huffington Post in 2015. Trump has also indicated that he doesn’t fully trust the medical community when it comes to vaccines. He said his children have all been vaccinated, but that they got the shots one at a time on an “old-fashioned,” “very conservative” schedule. This is an unscientific and potentially dangerous approach to the childhood vaccination schedule endorsed by the CDC, American Academy of Family Physicians and American Academy of Pediatrics. These groups recommend the optimal time and vaccine for each stage of a young child’s life. The schedule was created to protect children against life-threatening diseases as early as possible, and is recommended for everyone except for kids with immune system problems. But parents like Trump, who advocate spreading out the shots over a longer period of time, actually increase the risk of their children not receiving all of their recommended vaccines and being exposed to dangerous diseases while unprotected. They also force themselves to make more trips to the doctor — all without any medical benefit to the child. Trump tweeted in 2014 that there were “many such cases” of children developing autism after receiving too many vaccines at once, and said during a Republican presidential debate the following year that one of his employees’ children developed autism after getting routine childhood vaccinations. In fact, there is no reputable evidence that shows a causal link between autism and vaccines. And during his presidential campaign last year, Trump met with Andrew Wakefield, the disgraced doctor from the United Kingdom who ignited a firestorm with his now-retracted research suggesting that the measles, mumps and rubella shot caused some children to develop autism. He has since been stripped of his license to practice medicine in the U.K. and has become an anti-vaccine activist. Research is clear that areas with low vaccine compliance are at higher risk of preventable disease outbreaks. A 2015 JAMA study concluded that the year’s measles outbreak, which started at Disneyland in southern California, was likely exacerbated by the region’s substandard vaccination compliance. Vaccine noncompliance also played a role in the state’s 2010 whooping cough outbreak, which killed 10 infants. UPDATE: Jan. 11 ― In a statement issued Tuesday night, Trump spokeswoman Hope Hicks contradicted Kennedy’s account of the meeting with the president-elect.